WOW! Is all I can say about this first full day in Stellenbosch, South Africa. The Autodesk team arrived safe and sound to our wonderful hosts at the Fynbos Villa Guest House. Despite our various stages of jet lag, the team rallied together to get down to work on loading the latest technology onto laptops for Makapula High School. We will be spending the week getting to know the teachers and students at this local high school located in Kayamandi. Today we spent time getting to know more about the area that they call home. We were greeted by our guide – Voiu (VOY-U). He was a recent graduate from the high school and is working on turning his tourism experience into a small business. He is one of the few that completed his degree. By working with the Greater Stellenbosch Trust, Voiu will learn the vital skills to help his business succeed. So let’s learn a little more about were Voiu calls home. Kayamandi is a suburb of Stellenbosch in the Western Cape province of South Africa located off route R304. The name means “nice home” in the Xhosa language, from khaya meaning “home” and mnandi meaning “nice”. 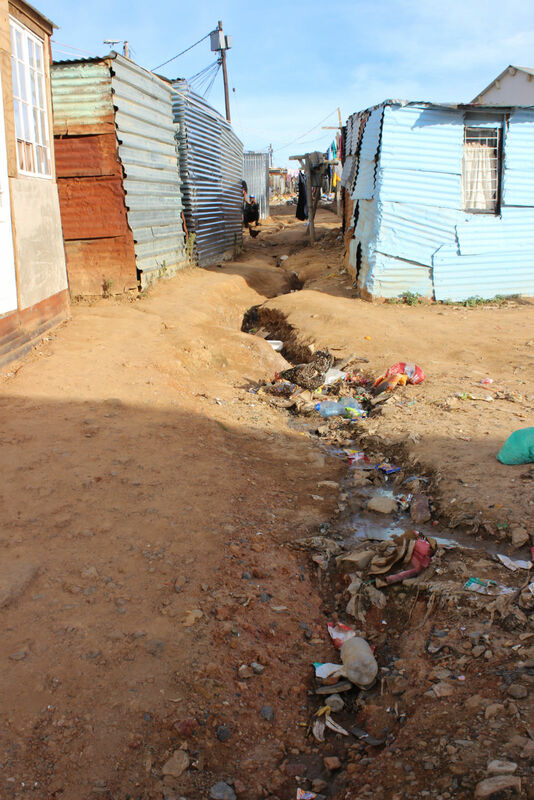 It was founded in the early 1950s as part of the increased segregation during the apartheid regime. It was originally built to house exclusively black migrant male labourers employed on the farms in the Stellenbosch area. In 1966, the nine largest employers in the Stellenbosch district including Stellenbosch University, the town administration, several vineyards and a fruit packing company united to erect 38 ready-made homes, so called hostels. 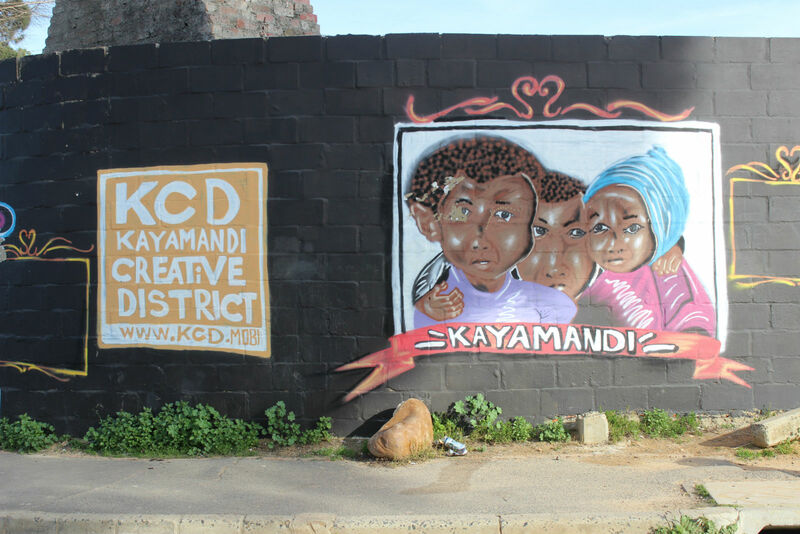 Kayamandi is one of the Developing Townships situated in Stellenbosch, there are many interesting projects done by young and old people of Kayamandi, such as Kayamandi Arts and Culture Festival. There are 4 schools in Kayamandi: Khayamandi High, Makhuphula High, Ikaya Primary and Kayamandi Primary. There are about 27 registered pre-schools and more than 10 registered organisations such as Vision Africa, Prochorus, Lokxion Foundation, Legacy Center, Trust Center, Songo.Info, IMBADU etc. Kayamandi is a soccer loving community with more than 20 teams, most of them playing informal soccer. From the moment we started our foot tour on the streets of the township, we were greeted with warm smiles, waves and general interest. We observed families gathering in the streets, children playing and neighbors enjoying the Sunday afternoon. As we walked up one of the first streets, I felt a tug on my jacket. My initial reaction turned from one of fear to joy as I saw eight little arms outstretched to greet me with a hug. This simple act was gladly accepted on my end. I looked around for their mother and our eyes met. It was a simple nod of acceptance from us both. It was OK for a stranger to hug her children. It was OK for me, that stranger, to enter their neighborhood. Below are a few of the photos from our walking tour that I wanted to share with with the TinkerFamily! I hope that you enjoy and look for more to come. Next up for the Autodesk and Team4Tech team is to begin training the teachers about digital skills, maker based learning and how to use technology to engage students. Previous Community Challenge: Penguin Movie Posters! Thanks for giving us a view of life so many thousands of miles away! I was thinking of doing a piece based on any indigenous animals common to the area…Seen any interesting critters? Send pictures or stories about any little lizards, bugs, birds, rodents, dogs, you think would be fun for people to see Tinkerized….